Young Brothers, Ltd., based in Honolulu, conducted an overhaul of its 108 foot, twin screw, ocean going tug, the Hoku Ke’a. As part of the refit, the owners installed integrated Nautican High Efficiency Nozzles, Triple Rudders and Propellers to give the vessel the muscle to tow larger barges while at the same time maintaining inter-island transit times. Young Brothers has been providing inter-island cargo service since 1900 throughout the State of Hawaii with ports in Honolulu, Maui, Molokai, Lanai, Hilo, Kawaihae, and Kauai. The Hoku Ke’a is one of more than a dozen Young Brothers tugs that haul loaded barges between Honolulu and neighbor island ports. Prior to the conversion, the vessel was fitted with conventional open propellers and rudders. The refit was conducted in the Foss Shipyard in Seattle, where the vessel received Nautican High Efficiency Nozzles, three-blade skewed Propellers and high-aspect ratio Triple Rudders. Installing the nozzles and rudders as an integrated unit saves significant installation time in the shipyard. In the case of the Hoku Ke’a refit, each integrated unit consisted of a 112” Nautican High Efficiency Nozzle and a set of high-aspect ratio Nautican Rudders. The nozzles were built with a head-box that houses the rudders together with the rudder stock, bearings, links and seals. The rudders were mounted on a removable cover plate to provide access for replacing the propeller. Dave Palmer, Estimator/Project Manager with Foss Shipyards said, “Although it was the first time [for us] with this installation design, I think it went much smoother [than prior refits] and I feel there has been an increase in the installation efficiency.” He notes that the effort for the alignment of the rudders was much less on the Hoku Ke’a refit compared to a similar upgrade two years ago on the tug’s sister vessel, Moana Holo. Mark Houghton, Vice President of Maritime Operations for Young Brothers, said that after the addition of Nautican Nozzles and Triple Rudders to the Hoku Ke’a’s sister tug the Moana Holo, the 3,000-horsepower tug demonstrated its strength when it pulled a bulk carrier free from a reef at Barbers Point after a 7,200-horsepower tug owned by another company failed to perform. 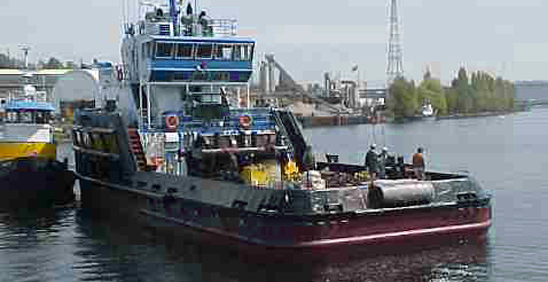 Once the overhaul was complete, the Hoku Ke’a left Seattle for Hawaii towing a 340’ x 78’ barge. The tug was able to make the run at reduced r.p.m. and still averaged between 9.5 and 10.0 knots for the Pacific transit. Pre- and post- conversion test runs between Honolulu and Kahului, Maui — in almost identical wind and sea conditions and towing a nearly equal load — demonstrated an increase of a half knot in speed while turning about 5 percent lower rpm’s, even with the higher operating speed. The upgrade gives the Hoku Ke’a the reserve bollard pull needed to maneuver larger barges through inter-island weather and sea states during the winter months, while at the same time consuming less fuel than a 5,000-horsepower equivalent vessel. Nearly 10 percent fuel savings were realized after the refit and the owners expect the conversion to pay for itself through faster transit time, labor savings and fuel savings, in less than four years, based on current fuel prices. After the installation of Nautican Nozzles and Triple Rudders, the 3,900-horsepower Hoku Ke’a’s bollard pull went from 88,853 lbs. with open propellers to 132,810 lbs. with the Nautican Nozzles. And, according to the tug’s owners, the high-aspect ratio rudders reinstated, if not improved, the vessel’s responsiveness by providing additional steering surface area in the aperture created by the Nautican Nozzles.